The “Champagne Heidsieck rule”, under which the importation and sale of legitimate branded goods has been held not to involve use as a trade mark, has historically provided an important mechanism to facilitate the parallel importation of trade marked products in Australia. However, following a number of recent Federal Court decisions, the rule has been written out of Australian law. This means that parallel importers and sellers of second-hand goods need to rely on the problematic defence contained in s 123 of the Trade Marks Act to avoid liability. This article traces the history and reception of the Champagne Heidsieck rule in Australia, and argues that the courts have taken a wrong turn by doing away with the rule, in part based on a misunderstanding of the history of the role of confusion in registered trade mark law. After discussing the numerous problems with the current s 123 defence, we consider how the Australian law on parallel importation and sale of second-hand goods could be improved, concluding that the best option is to resurrect the Champagne Heidsieck rule. In copyright law, at the point of interface with design law, residual plan to plan liability creates remedial uncertainty for the person who today might be found to be an infringer. This article suggests that the remedial logic of the springboard doctrine in breach of confidence law should be considered appropriate for cases of plan to plan copyright infringement within the scope of that residual liability. Since the introduction of plain packaging for tobacco products in Australia, three legal actions have been brought against the Australian Government. In addition, various other legal actions have been taken or threatened in relation to the proposals of governments to introduce similar legislation in other jurisdictions. This article provides an overview of the different types of regulatory action taken by governments and the legal actions that have been or are currently being taken against government regulation of tobacco packaging and gives an indication of future action that might be taken in various fora. 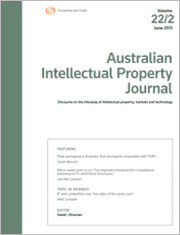 This article provides a 20-year retrospective on non-traditional trade marks in Australia. It presents the initial findings from an empirical study on the application and registration of such trade marks in Australia, since the introduction of the Trade Marks Act 1995 (Cth). It concludes that while the data shows that shape and colour trade marks remain popular subjects of trade mark applications, sounds and scents have yet to live up to the hype or pose the kinds of controversies that these categories of marks were anticipated to present. For the PDF version of the table of contents, click here: AIPJ Vol 26 No 3 Contents.